An experimental method to measure the spin polarization of a ferromagnetic nanomagnet using Anomalous Hall effect (AHE) is described. A high precision, repeatability and simplicity are the features of this method. Fig 1(a) Schematic diagram of measured hysteresis loop of Hall angle αHall in a ferromagnetic metal (solid blue line). The green dash line shows the imaginary case if spin polarization would not depend on magnetic field. The red dot line shows the case when spin polarization of metal is close to 100 %.Click on image to enlarge it. Fig. 1(b)Spin precession and precession damping in a magnetic field Hext . During the precession the spin aligns itself along the direction of the magnetic field. Click on the image to enlarge it. The spin polarization is evaluated from non-linear dependence of Hall angle αHall on H. The green dash line shows the imaginary case if spin polarization would not depend on magnetic field. The red dot line shows the case when spin polarization of metal is close to 100 %.Click on image to enlarge it. where αAHE is the Hall angle in the absence of an external magnetic field, βOHE is the Hall coefficient; H⊥ is the magnetic field applied perpendicularly to the film. Can experimentally observed increases of the Hall angle be due to the ordinary Hall effect? Which parameters influence the Hall angle of Anomalous Hall effect (AHE) αAHE ? From Eq. (1.11), three contributions can be identified. The spin polarization increases in a magnetic field due alignment of spins of conduction electrons along the magnetic field (See Fig.1b). An external magnetic field may suppress some some spin relaxation mechanisms (See below for details). The spin polarization of a nanomagnet was evaluated using the Anomalous Hall Effect (AHE). The FeB, FeCoB and FeTbB films were grown on a Si/SiO2 substrate by sputtering. A Ta layer was used as non-magnetic adhesion layer. A nanowire of different width between 100 and 3000 nm with a Hall probe was fabricated by the argon milling. The width of the Hall probe is 50 nm. The FeB and FeCoB layers were etched out from top of the nanowire except a small region of the nanomagnet, which was aligned to the Hall probe. The nanomagnets of different lengths between 100 nm to 3000 nm were fabricated. where sferro , snonMag are conductivities of ferromagnetic and non-magnetic metals; tferro , tnonMag are their thicknesses, VHall is the measured Hall voltage, I is the bias current and R,L,w are the resistance, length and width of the nanowire, correspondingly. What is the spin polarization? where nTIA and nTIS are the numbers of spin-polarized and spin-unpolarized electrons, respectively. How to divide all conduction electrons into the group of spin-polarized and spin-unpolarized electrons? In fact, all conduction electrons in a ferromagnetic metal are divided into 3 groups: of spin-polarized, spin-unpolarized electrons and spin-inactive electrons. In the group of the spin-polarized electrons, the spins of all electrons are in the same direction. In the group of the spin-unpolarized electrons, the spins are distributed equally in all directions. Additionally, there are some electrons, which are "spin-inactive". A pair of these electrons with opposite spins occupies one quantum state. The occupation of quantum states by the electrons of both the spin-polarized and spin-unpolarized groups is one electron per a state. As a result, the spin of each state is 1/2 and the spin direction for each quantum state is defined. The spin direction represents the direction of the local breaking of the time-inverse symmetry for the state. When a quantum state is occupied by two conduction electrons of opposite spins, the spin of such quantum state is zero. As a result, the spin direction of this state cannot be defined and the electrons occupying this state are "spin-inactive". The electrons, which energy is substantially below the Fermi energy, mainly belong to this group. For example, nearly all of the “deep level” electrons belong to this group. In contrast, the energy of electrons of the groups of spin-polarized and spin-unpolarized electrons is distributed mainly nearly the Fermi energy. See details here. M. Julliere, Phys. Lett. A 54, 225 (1975). R. Meservey and P.M. Tedrow, Phys. Rep. 238, (1994). R.J. Soulen Jr RJ et al, Science 282(1998). The spin polarization is evaluated from the tunneling properties of a superconductor-metal contact. C. Aku-Leh,et al .Phys. Rev. B 76, 155416 (2007). B.T. Jonker, Proc. IEEE 91, 727 (2003). merits: (1) spatial distribution of spin polarization can be checked. Why in one metal the spin polarization is smaller and in another metal is larger? What does influence the spin polarization? The spin polarization sp of the electron gas is defined as a ratio of the number of spin-polarized electrons to the total number of the spin-polarized and spin-unpolarized electrons. The amount of electrons in each group is determined by a balance between the spin pumping and the spin relaxation. The spin pumping is the conversion of electrons from groups of spin-unpolarized electrons into the group of the spin-polarized electrons. The spin relaxation is the conversion in the opposite direction. Detailed explanation about spin polarization is here. where tpump is the spin pumping time, nTIA and nTIS are the numbers of spin-polarized and spin-unpolarized electrons, respectively. where trelax is the spin relaxation time. How to increase the spin polarization? Spin precession and precession damping in a magnetic field. During the precession the spin aligns itself along the direction of the magnetic field. Click on the image to enlarge it. Is it possible that the spin relaxation is reduced in an external magnetic field? Does it influence the spin polarization? Absolutely. An external magnetic field reduces the spin relaxation. This reduction should be included into an evaluation of the spin polarization. reduction of mechanism 1 : the spin-dependent scatterings: Even spin may be rotated after a spin-dependent scattering, in a magnetic field it quickly rotates back to be along the magnetic field. Therefore, the spin- dependent scattering does not lead to the increase of the spin relaxation. reduction of mechanism 2 : incoherent spin precession in a spatially inhomogeneous magnetic field: A large magnetic field levels out and fully compensates any possible inhomogeneities of internal magnetic field in a metal. A magnetic field reduces or even this type of the spin relaxation. Can direction or magnitude of the magnetization change in an external magnetic field.? How does it influence the spin polarization measurement? A. It does influence very much. (1). Magnetization inclination. Keeping the magnetization in the same direction is very important for these measurements. The sample geometry and the scan range of magnetic field should chosen to avoid any (even slight) magnetization inclination or domain movement. (2) Change of magnetization magnitude. In a magnetic field the spin polarization sp increases. The increase of sp may cause the increase of the magnetization as well. The amount of increase of the magnetization is difficult to measure. The correct measurement of such increase is still a challenging task. 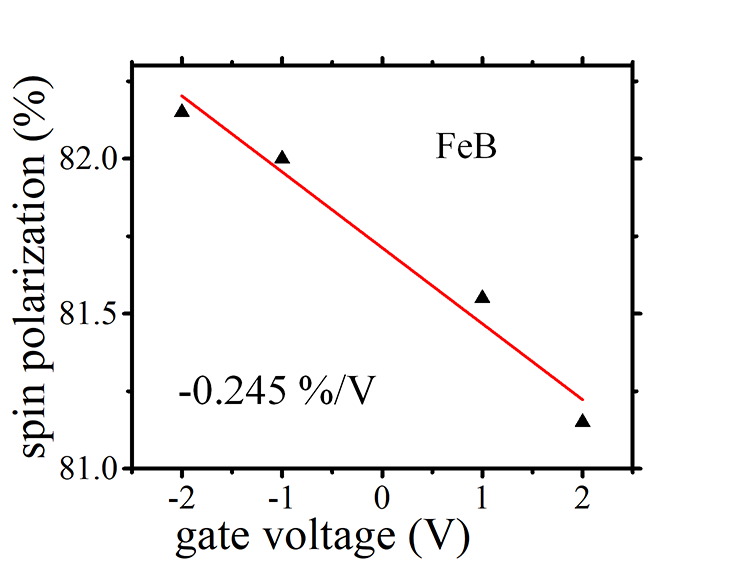 Figure 14 shows the gate-voltage dependence of the spin polarization in the FeB sample. The measured voltage-dependent change of the spin polarization is -0.245 %/V. The change is substantial and it can be reliably measured. For example, the observed voltage-dependence of 1st derivative of αAHE(Fig.3(c)) is about 5 %. For the FeCoB sample the voltage-dependence of sp was smaller ~ -0.0068%/V. For both samples, the sp depends linearly on the gate voltage and the polarity of the dependence is the same as the polarity of the voltage-dependence of anisotropy field Hanis, coercive field Hc , Hall angle αAHE, magnetization switching time tswitch , and retention time treten. VCMA and TMR effects. It would be interesting to correlate this gate tuning of spin polarization with the bias-dependent TMR experiments which have been traditionally explained with barrier height modulation. A. I guess there are several contributions to the bias-dependence of TMR. The voltage dependence may have some contribution. However, it should be a contribution, which is polarity dependent. The voltage-control change of the spin polarization always changes its sign, when the voltage polarity is reversed. I have checked many samples already. The spin polarization always linearly increases under a negative gate voltage and it always linearly decrease under a positive gate voltage. The effect of Spin-Orbit torque (SOT effect) describes the fact that magnetic properties of ferromagnetic nanowire may depend on the magnitude and polarity of an electrical current flowing through the nanowire. For example, under a sufficiently large current the magnetization of the nanowire may be reversed. The direction of the magnetization reversal depends on the polarity of the current. The effect may be used as a recording mechanism for 3-terminal MRAM. The origin of the SOT effect is the spin Hall effect, which describes the fact that an electrical current may create a spin accumulation. Figure 14 (a) shows the measured spin polarization sp of the FeB sample as a function of the current density. The sp decreases for both polarities of the current. The used current density is relatively large and the decrease of sp is assumed to be due to the heating of the nanomagnet. The increase of the nanowire resistance confirms the increase of the nanowire temperature. In order to exclude the influence of heating, the spin polarization was measured at the same current, but for two opposite current directions. Figure 14(center) shows the change of the spin polarization as the polarity is reversed. The change of the sp linearly depends on the current. 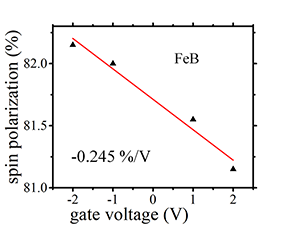 The measured slope is +0.00524 %/(mA/mm2) for the FeB sample and -0.018 %/(mA/mm2) for the FeCoB sample. Why are the slopes of Figs. 14 (b) and 14(c) different? A. The polarity of the spin polarization generated by the Spin Hall effect are different at opposite sides of nanomagnet (see here). In the case of a symmetrical nanomagnet, the generated spin polarization is the same at opposite sides of the nanomagnet, the total generated spin polarization is zero and there is no SOT effect. Our studied samples are asymmetric. The ferromagnetic metal is contacting the MgO at one side and the Ta at another side. As a result, the total spin polarization generated by the Spin Hall effect is non-zero. However, in this case the contributions from each interface are nearly equal. It can explain the observed substantial change of the slope for different nanomagnets on the same wafer and the different slope polarities for the FeB and FeCoB samples. The enlargement of structure asymmetry and optimizing interfaces may increase the current- induced change of sp. There are clear oscillations of measured 2nd derivative of αAHE vs H of an unknown origin. The physical origin of the oscillations is not yet understood. The oscillations exists for all measured samples.